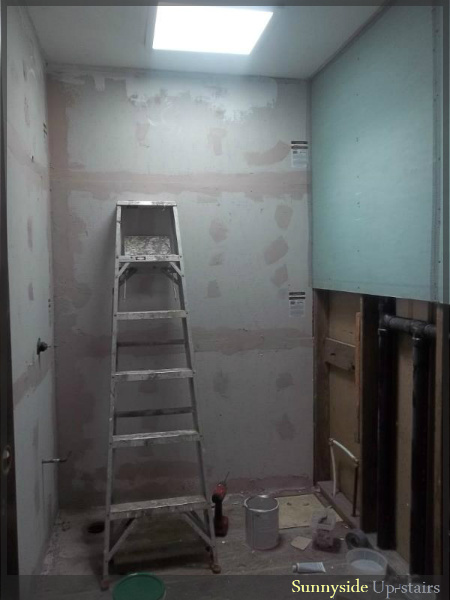 We completed the major work in our bathroom in December 2012 with much help from our family friend and his boss, who is an electrician and contractor. 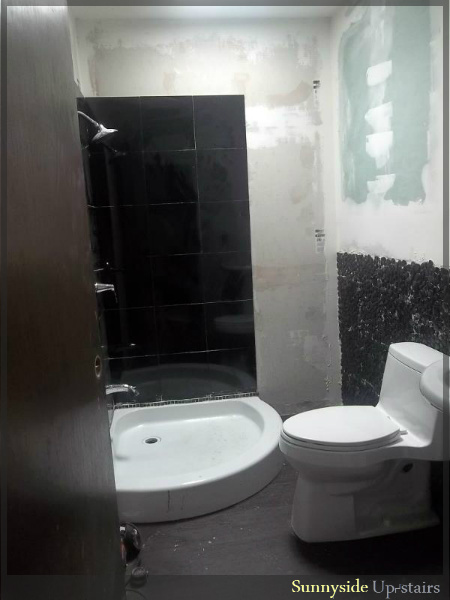 Initially, I wanted to just add some paint, new flooring, and personalized touches to complete a $200 bathroom makeover, but we peeled back the duct tape in this previous rental bathroom and found mold and mildew saturated drywall and other unmentionables. 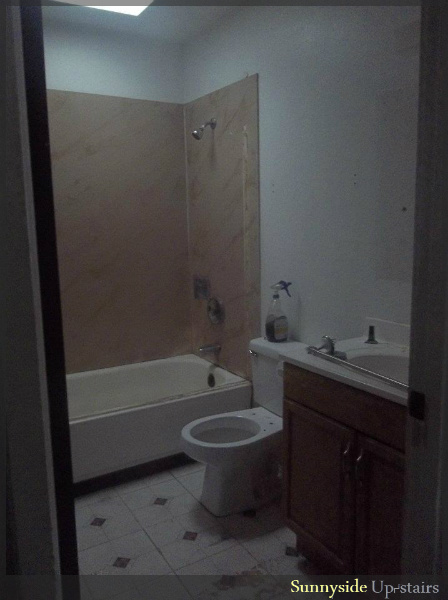 We reluctantly decided to gut the entire bathroom, took out a loan, and used $2,500 to make it our own. 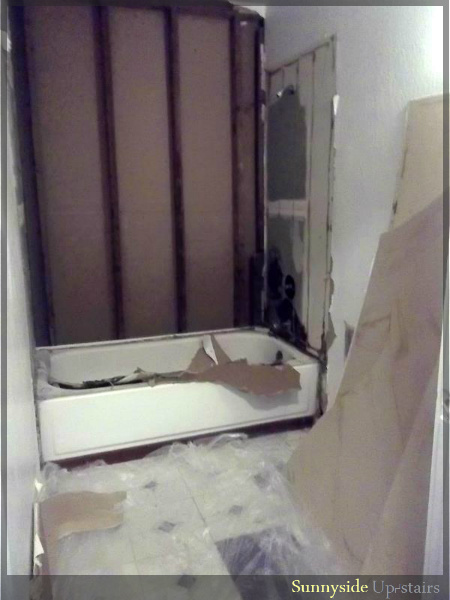 My husband and I "demoed," lay flooring, tiled and grouted, hung the mirror, built and installed the floating shelves, and painted. 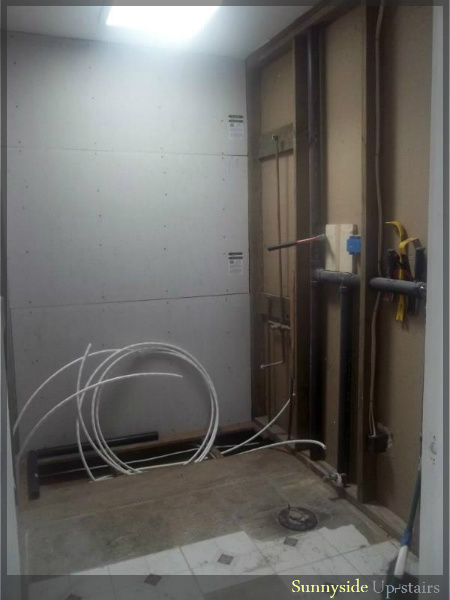 The major jobs, like relocating electrical switches and plumbing, installing the shower, toilet, and pedestal sink was all done by our friend and electrician-contractor in the summer of 2012. 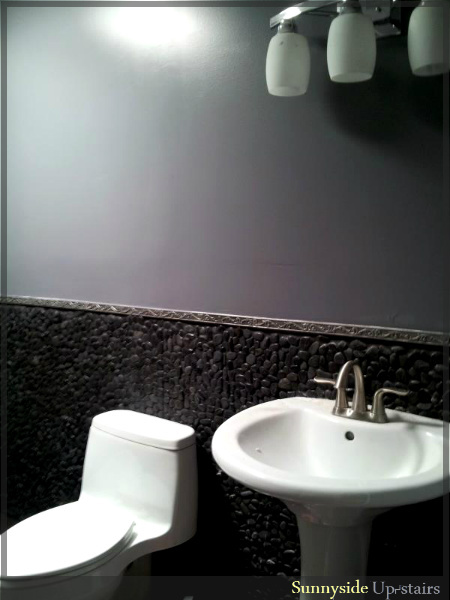 The bathroom renovation was completed in December when I finally rolled Victorian Pewter in Olympic Semi-Gloss on the walls. 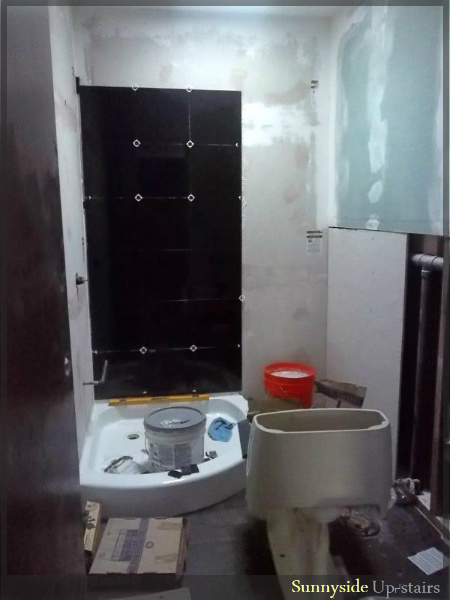 However, when we moved into our apartment, we put "finishing" the bathroom aside to complete the major work in other spaces. 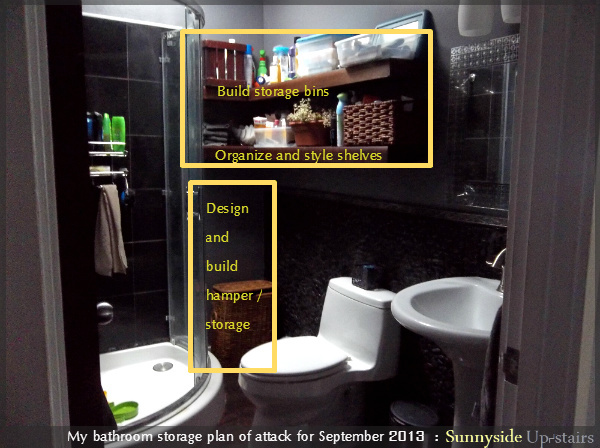 I'm looking forward to tackling our bathroom storage projects! 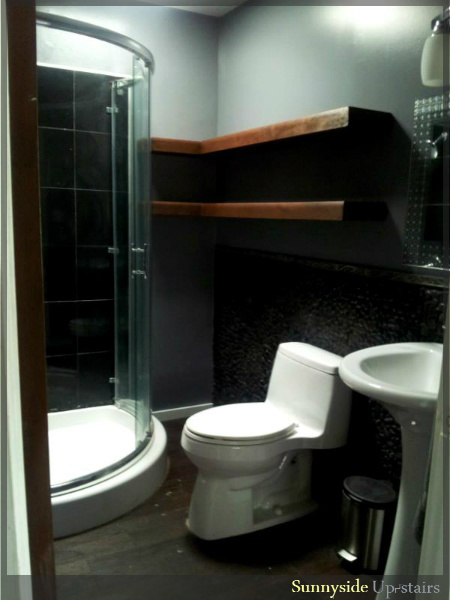 Beautiful bathroom! 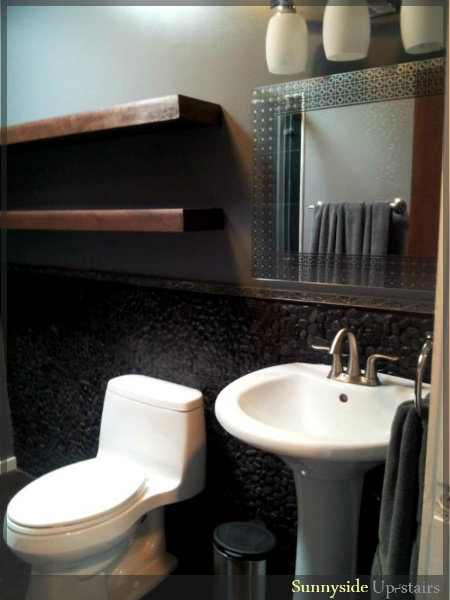 The colors and fixtures in this bathroom are fab! The tiles and surfaces are very elegant and high-end looking. Love the cool design around the mirror, would love to see some close-ups of that. The tabs for the pictures make a really cool time-line! 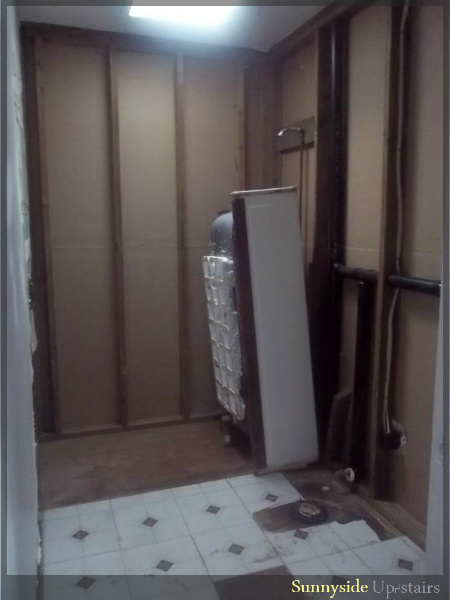 Did you have to tear out the whole old floor before installing the new? Can't wait to see all your storage solutions! Wow, what a beautiful transformation! Much more modern and chic. Can't wait to see what you come up with for the final touches. Thank you, Sharon. 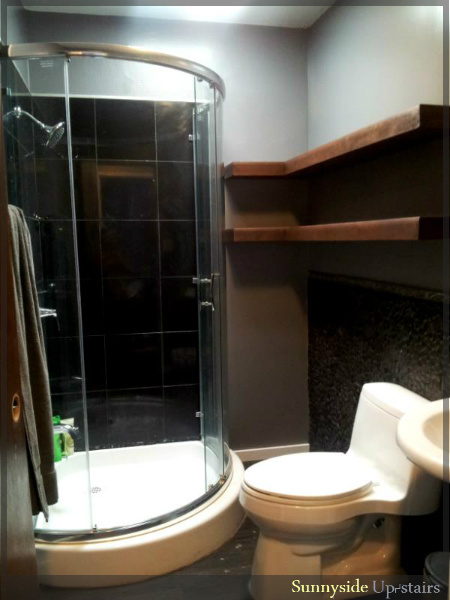 :) Most of the credit goes to my husband here, since he chose the elements of the bathroom. 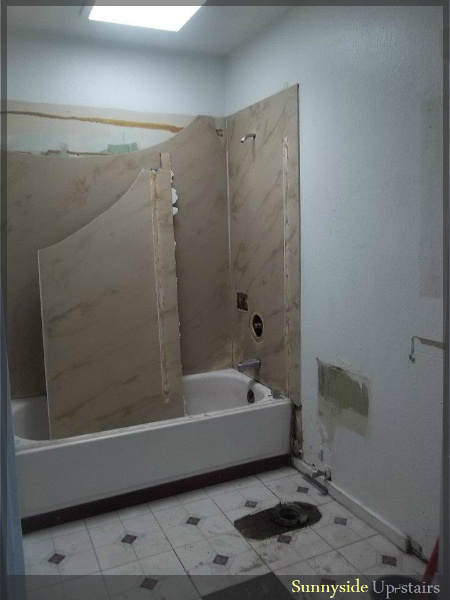 I was planning to do some quirky things with free tile we had on hand. Instead, I made cheap "WhiteBoard Minis" for Christmas gifts for my students and coworkers. Haha. =D It turns out tile makes a neat little place to write notes with dry erase markers. Looks really nice too bad you don't have a tub anymore with those colors it looks like it would be perfect to relax in there. Ooh, that sounds lovely! =D I can't wait to see it on your blog!